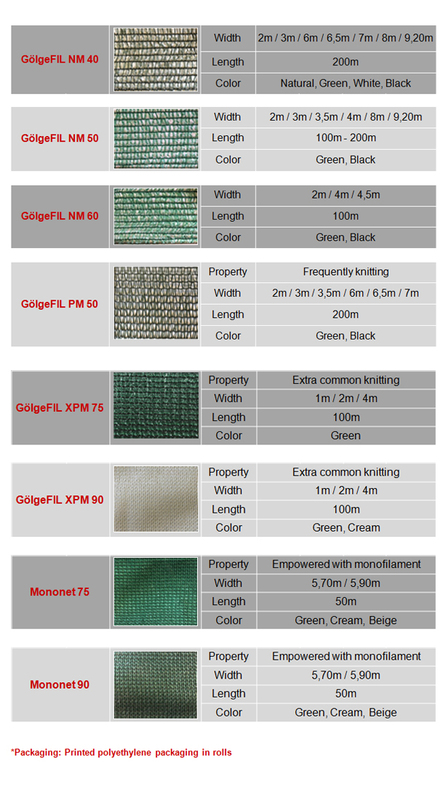 It provides protection from sunlight, wind and temperature changes in all areas in use.The GölgeFIL that breaks the Sunlight satisfactorily and provides a homogeneous distribution, has an extensive usage area. Provides optimum shadowing in greenhouses, gardens, nurseries, landscape areas, ornamental plant manufacturing sites. It is used in restaurants, beaches, sports arenas, pools and car parks. Makes shadowing and provides protection against harmful solar rays in livestock industries and animal shelters. Wide Product range provides shading between %25-%90. When implementation conditions are provided it is durable to laceration. Provides air circulation at ideal level. Our products are rolled doubled with Folding machine.